Episode 35 of Attack on Titan, “Children,” opens in the obscure village of Ragako. Executive officer, Moblit Berner, leads an advance guard into the destroyed city following Commander Hange’s direct order. The urgency of the mission is potent as the town’s bloodless aftermath may hold answers as to why there’s been a sudden infiltration of Titans within wall Rose, albeit any visible breach to the wall itself. Upon arrival, the soldiers come to a similar set of conclusions that Connie and the others do during a previous visit. Initially, they entertain the notion that the town may have been evacuated before the attack, as there’s no sign of blood, bodies, or carnage. They quickly dismiss the idea, however, considering all the horses remain untouched in the unscathed stables. There’s no way the villagers could have escaped without the aid of their horses and it seems even more unlikely that a hoard of Titans would destroy a village without leaving any sign of mutilated bodies in their wake. They scale the city and quickly locate their mission directive, a seemingly starved Titan that lay motionless atop Connie’s demolished home. As they survey the scene, a soldier hands Moblit a photo of Connie Springer’s parents just before the Titan tries to shake itself free from the ruins, where it appears to be trapped. Out of shock, Moblit drops the picture but commands a fellow officer to stand down after he draws his weapon. Officer Berner instructs his soldiers to cease-fire, as the Titan presents no real threat given his disproportionate figure and current condition. It’s not just the paralyzed position that prompts the order, but more so a poignant realization Moblit comes to in that moment. As he picks up the photo and compares it to the Titan’s face, he comes to a shocking conclusion: it is in fact Mrs. Springer herself that embodies the Titan shell that lay before them. It’s been alluded to in past episodes that there’s a strong likelihood humans are being transformed into Titans as a method of warfare. We can now assume this to be true based on the discovery at Ragako. It was thought that the Beast Titan could conjure average Titans out of thin air, but it seems more likely that he’s actually creating them out of human subjects. When discussing this process it’s also important to note Eren’s basement and the injection his father administered to him during childhood; a process that likely birthed in Eren the ability to transform into a Titan. Connie’s mother may be critical in discovering the biological quality that allows for this to take place as well as motive for engaging in the process, who’s leading the operation and why. Following the opening scene and introduction, we circle back to the Forest of Giant Trees where Reiner and Bertholdt are stashing Eren and Ymir. They know they have to move quickly as the Scout Regimen draws closer by the second, evidenced by the smoke of the flairs in the sky. Bertholdt grabs Reiner and asks him desperately who he is, hoping that Reiner is identifying with his warrior personality and not that of a human soldier. Reiner confirms he’s sound of mind and also endorses the fact that Ymir can now be trusted as a warrior too. Bertholdt’s a bit uncomfortable with this notion as it’s revealed that Ymir previously devoured one of their friends when in Titan form. They discuss the fact that there’s a lapse in memory and judgment when humans are becoming acquainted with their Titan powers, a reason not to scrutinize her for her actions. It seems as though there’s a transitional period in the beginning stages of discovery. Growing pains if you will, that all four, including Eren, can attest to. 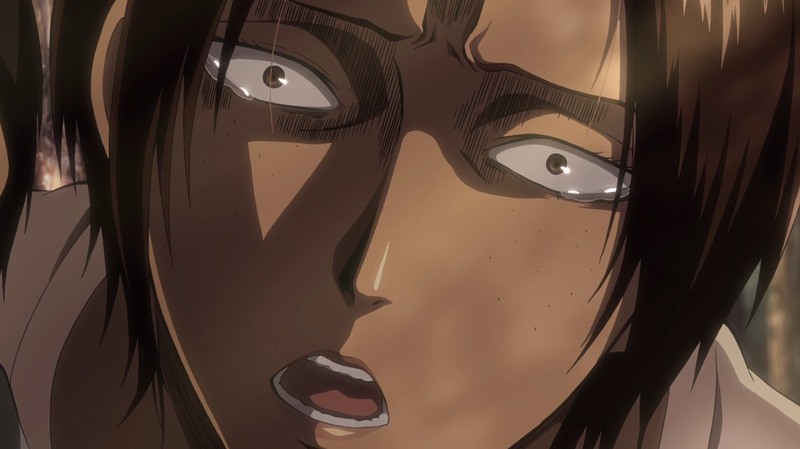 Three: Ymir’s selfish ultimatum to capture Krista or fight everyone around her in an effort to see her one last time. This is what seems to be the ultimate connection between Reiner, Bertholdt, and Ymir. Their agreement to her last act of desperation instills trust in both sides and puts the ultimate seal on their partnership. Amidst the high intensity of the pursuit, the show takes us back to Ymir’s childhood where we learn of how she came to be, as both woman and Titan alike. Captured as a young girl by a mysterious religious group outside of the wall, she’s taken to a foreign community where she goes on to be worshiped by the people living there. Her kidnappers claim to the village that the blood of king runs through Ymir’s veins, and because of this, the community will gain the gift of immortality through her divine presence. After many years pass, a military group infiltrates the village. Their objective is to apprehend and punish all those who’ve engaged in false worship. Ymir is eventually singled out and questioned at gunpoint. When asked of the validity of her holy bloodline she propagates the lie and claims further that her leadership within the community is based on royal birthright. This proves to be of no help as Ymir and her loyal worshipers are captured and condemned to what we first believe to be a death sentence. Following a stoning through the city, she and the rest of the captors are placed on the ledge of a huge wall, bound and tied. It’s unclear the site of punishment but one can only guess it’s connection to humanity’s three great monuments of protection. Similarly, it’s not far off to think that The Church Of The Wall is the responsible for carrying out this religious persecution. Before it’s Ymir’s turn to face judgment, she witnesses her fate through the punishment of someone else. A stabbing of some variety is inflicted on the woman to her right. Following the mutilation, the woman’s shoved off the wall. A familiar light ignites the night sky and Ymir watches in horror as the woman falling almost certainly transforms into a titan. Immediately after, Ymir suffers the same fate. It is then that she experiences her first moments as free woman in an enslaved Titan’s body. After her transformation, she roams aimlessly, contemplating her punishment. She believes her grotesque new form is the karmic result of all her lying over the years. Lying in an effort to be needed by others. We see her take rest after who knows how long, and let the earth conceal her as she falls into a deep hibernation. She wakens several years later to find Annie, Bertholdt, Reiner, and a man by the name of Marcel using her resting site as their campground. Naturally, they’re terrified when she emerges from beneath the earth. Ymir launches forward in an aggressive attack, satisfying her hunger by devouring Marcel, who sacrifices himself to save Reiner. Why did they flee in fear? Couldn’t any of them transform into Titans at this point? Ymir feels an immediate connection to the girl they’re speaking about, noting they share a similar set of circumstances. She seeks out the one they call Krista Lenz by joining up as a soldier in her camp. From the moment they meet, to present time, Ymir’s ready to risk everything for her. She’s deeply in love with Historia Reiss, and the fact she in turn loves her back, is everything to Ymir. This is her driving force. And as we circle back to the forest, Ymir prays that her guiding light will forgive her one last time for the horrific act she’s about to commit. The episode ends in present time where the scouts find Ymir oddly stationed on one of the trees in the giant forest. She’s in Titan form and doesn’t seem to be doing much of anything. Armin quickly concludes that something isn’t right, noticing that Ymir is diligently scanning the scouts, as they beg her for information. Suddenly Krista appears, Ymir’s eyes sharpen and in a shocking turn of events, she jumps from the tree towards Krista and swallows her whole. The scouts race forward, chasing Ymir at full speed as she plunges further into the forest, closing in on Reiner’s position. Upon seeing her approach, Reiner slices his hand and transforms into the Armored Titan, waiting at the clearing for Ymir to catch up. She eventually does and attaches herself onto his back with Krista tucked inside her mouth. The scouts, including Mikasa and Armin, all stop in horrified shock as they see Eren strapped to the back of Bertholdt riding atop a transformed Reiner. As they slip farther into the distance, a surge of hope fills the final seconds of the episode, as Hannes demands that no one stop pursuing the target. He wrangles the horses and charges forward with what’s left of the soldiers as they passionately ride into the unknown; willing to risk everything including their lives to get back humanities last hope: Eren.